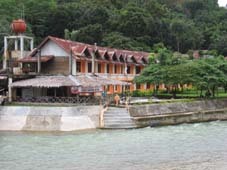 Sumatra Travel now have available package tours to Bukit Lawang. For more details click here. If you would like a car to collect you from your hotel in Medan or from the airport and be taken to Bukit Lawang click here to contact us. Price is 600,000Rp (around 49 Euros) for up to 4 people. This is a quicker, safer trip of under 3 hours from your hotel. The vehicle used is a new air-conditioned Ford Everest SUV. Contact us if you have a larger group and a price can be quoted for a larger vehicle. Pretty basic rooms, with fan and mosquito net, though. My room was upstairs with a bit of a view over the river. Outdoor restaurant area is nice, staff friendly. It is a good location (better than up Jungle Inn end), close to transport, and seems to be a meeting place for guides for orang utan walks. Pity the rooms aren\'t a tiny bit better. Would recommend Sibayak, though, especially if on a budget. 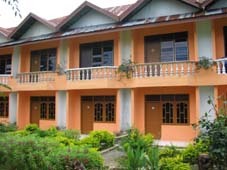 Have you stayed at Wisma Leuser Sibayak?